Disruptor Beam, the company that brings together fan communities and games, in partnership with HBO Global Licensing and Kongregate, has today announced that Game of Thrones Ascent is now available on Apple iPhone and Android devices! 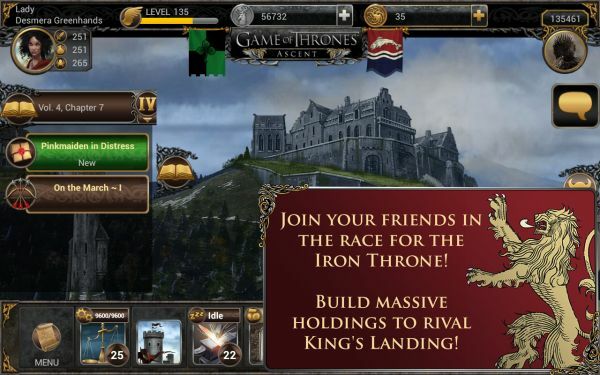 First released online in 2013, followed by iPad in April 2014, Game of Thrones Ascent is the first social game based on the award-winning HBO® show and literary works of George R.R. Martin. Fans can now remain immersed in the world of Westeros even beyond the end of Season 4 of the show on their mobile phones. With Game of Thrones Ascent, fans can immerse themselves beyond the books and show, living the life of a noble in Westeros, working with (or against) each other in a persistent, authentic game world. Taking part in thousands of story-driven quests, players delve deeply into the lore and develop their own lands and reputation among the Great Houses. Players explore an expansive world filled with deep political and social play involving diplomatic agreements, pacts, marriages, and betrothals. Through Alliance challenges, players work with hundreds of others to accomplish great tasks and rise to the top of the Power Rankings. Download the game in the App Store https://itunes.apple.com/app/game-of-thrones-ascent/id799145075?mt=8, as well as in the Google Play store https://play.google.com/store/apps/details?id=com.kongregate.mobile.gameofthronesascent.google, starting today. CJ Games Global is kicking off second anniversary celebrations for Uncharted Waters Online. This week SKARA, The Blade Remains joined the list of games available via Steam Greenlight, the worldwide distributor of videogames online. The game is similar to MOBAs such as League of Legends or DOTA2, but with a turn-based twist.